This will take you to the Keyboard Preferences window. 2) Click the Layout tab. 3) If you have more than one keyboard layout listed, select the one you use, then click the Options button. This will take you to the Keyboard Layout Options window. 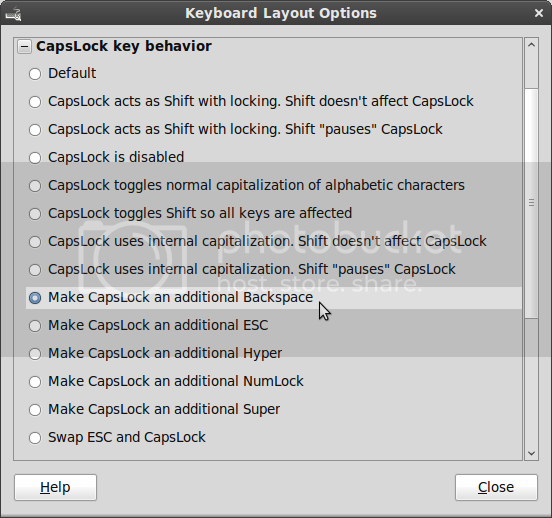 4) Scroll down to the CapsLock key behavior list item, and expand it. 5) Select Make CapsLock an additional Backspace. Notice that you can use this to change CapsLock in other ways. The KDE edition does not have a graphical method of accomplishing this (At least in Gloria), so a more hands-on approach must be done to get this change. 1) Open Dolphin (the file manager), and view your home folder. 3) Look for a folder called .kde or .kde4 depending on your edition of KDE. Once you've located it, open the folder. 10) Now we need to make the file executable. To do this, right click the file, and select Properties. 11) Click the Permissions tab. 12) Click the checkbox labeled Is executable. Then click OK.
You will have to log out, and then log back in to see the change. Notice that you can use this to change CapsLock to be any other key of your choice, but it would take some knowledge of what the codes for the keys are. If you wish to apply a different function to Backspace, first research what the key is called before assigning CapsLock the new value. Xfce was tricky to get working. While theoretically, adding the shell script (as shown above) to the list of Startup Applications should get it working, it doesn't in practice (version 4.6). Nevertheless, there is a solution. 3) Click the Layout tab. 4) Verify that the checkbox labeled Use system defaults is checked. 5) Open Thunar (the file manager), and view your home folder. 8) Open the file .Xmodmap with a text editor, like Mousepad. To do this, right click the file, and select Open With "Mousepad"
blue_bullet	 Very straightforward as it should be. I Googled other methods. They were too complicated, out of date, or just simply did not work. Thank you.